1. Challengeron willemoesii Haeckel, Ovate form; lateral view, PB: 667, SEM, x 120. 2. Challengeron willemoesii Haeckel, Ovate form; oblique dorsal view, PB: 667, SEM, x 100. 3. Challengeron willemoesii Haeckel, Ovate form; lateral view, E: 988, LM, x 210. 4. Challengeron willemoesii Haeckel, Ovate form; lateral view, E: 988, LM, x 210. 5. Challengeron willemoesii Haeckel, Ellipsoidal form; lateral view, PB: 1268, LM, x 210. 6. Challengeron willemoesii Haeckel, Ellipsoidal form; lateral view, P1: 2778, SEM, x 190. 7. Challengeron willemoesii Haeckel, Ellipsoidal form; lateral view. Specimen purposely broken for observation of microstructure., PB: 1268, SEM, x 215. 8. Challengeron willemoesii Haeckel, An extensively dissolved specimen. Note skeletal microstructure., PB: 3791, SEM, x 330. 9. Challengeron willemoesii Haeckel, Same specimen; outside surface, PB: 3791, SEM, x 800. 10. Challengeron willemoesii Haeckel, Same specimen; inside and outside surfaces of amphora structure are shown., PB: 3791, SEM, x 2600. 11. Challengeron willemoesii Haeckel, Typical sediment trap specimen showing solid unit of amphorae and porous cementing unit between amphorae; cross section and inside surface., PB: 1268, SEM, x 3400. 12. 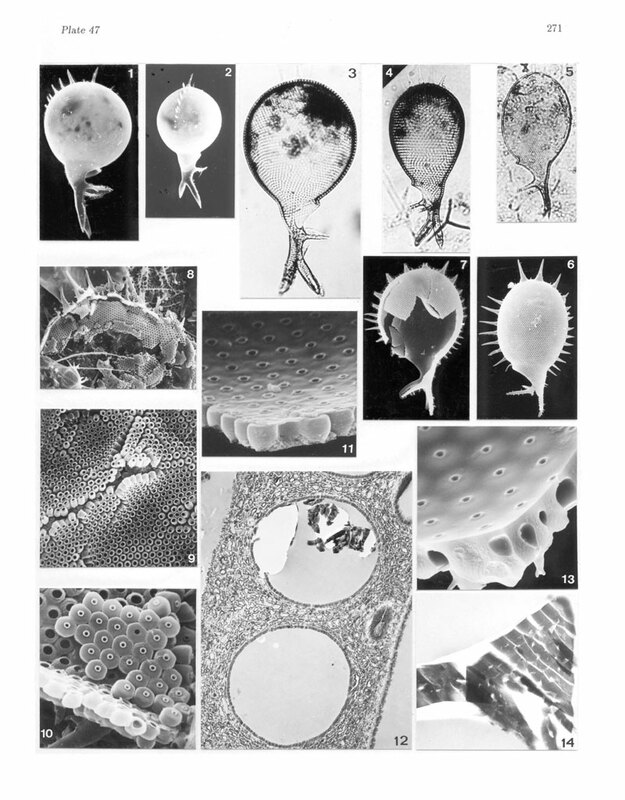 Challengeron willemoesii Haeckel, A section of figure 11; note the porous area is composed of tubes., PB: 667, TEM, x 11,900. *a: Notice how necks of amphorae secure themselves with inside surface membrane. *b: Note that pores (ca. 50-500 angstom in diameter) are distributed in the part corresponding to the cementing units of figure 8-12, but not on surfaces of amphorae nor outside of shell; conchoidal fractures are artifact due to sectioning.